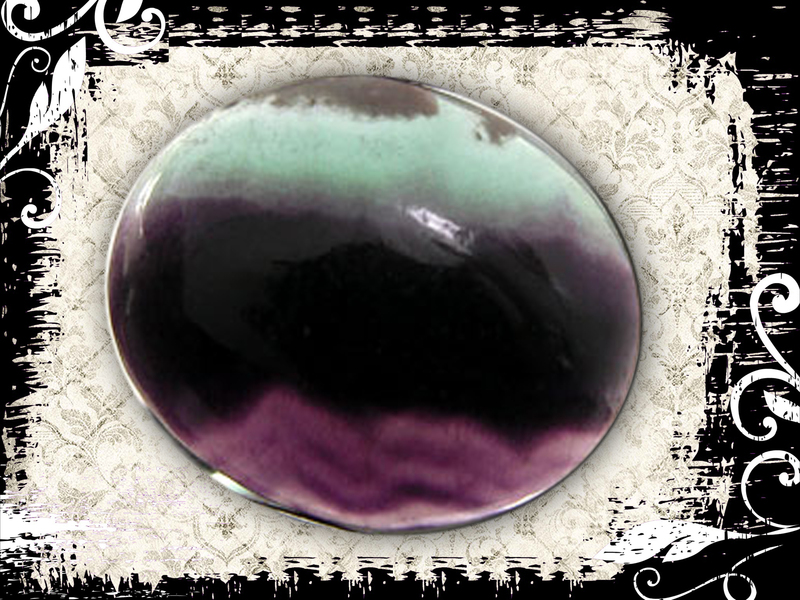 I bought this flourite cabochon a little while ago but it’s taken me a little while to come up with a way to set it. It has quite intense colour striations, especially the purple, and I was concerned it would look dark and muddy once set. So I put it to one side, got on with other things and kept it on the back burner. Luckily it didn’t fall down the back of the cooker! I came up with the idea of putting a gap between the stone and the back of the setting, to allow light to enter the stone from behind, and figured a shiny surface would act as a mirror as well. I’d textured an oval with a leaf skeleton using the rolling mill, and soldered an oval to the rear of it for strength. Initially I added a cross of wire to the back, bent up around the oval to form claws which would be soldered to the bezel, but it looked a bit too Heath Robinson, even for me! So I took that off, and cut small lengths of 2mm sterling wire to use as upright posts. I soldered these to the base oval, squared them off and added a ring of reticulated silver to the top post before soldering the bezel (also leaf textured) on top. A few hours in the tumbler while I went out for lunch, a quick dip in liver of sulphur to oxidise it, and then the polishing begun! 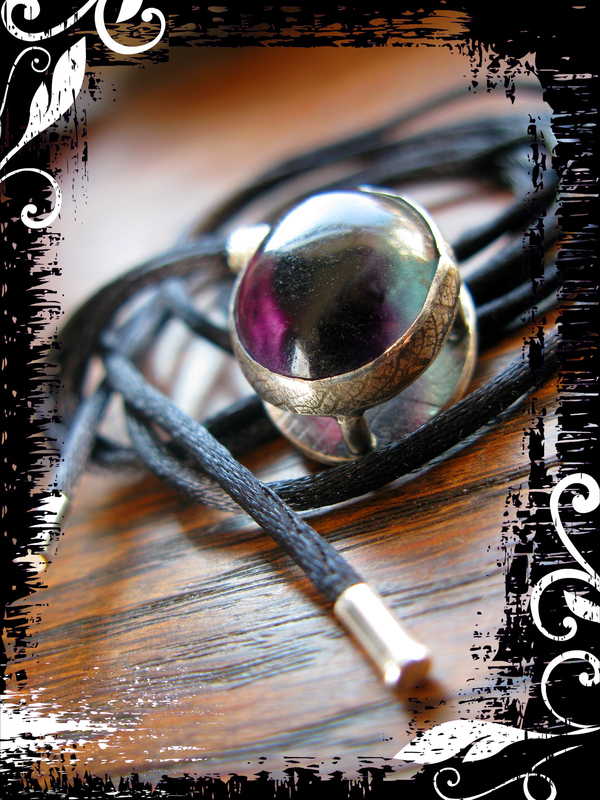 Once I had a finish I was happy with, I set the fluorite into the bezel and gave it a final polish, before hanging it from a black satin cord with sterling silver ends and a twist of fine wire just above the pendant to stop it from slipping. Time to test the theory and emerge squinting from the shed… I’m delighted with it, it worked really well. I’d love to know what you guys think! Welsh Grand Slam, Triple Crown and Six Nations – Oh Yes! As an adopted Welsh (with some Welsh blood), I’ve been watching the Six Nations avidly, and was biting my nails last Saturday in the hope that Wales would win not only the Six Nations but the Grand Slam as well – on top of the Triple Crown. For the uninitiated, the Six Nations is an annual rugby tournament between Wales, England, Scotland, Ireland, France and Italy. It is a BIG thing here. The Triple Crown is awarded if one of the UK home nations beats the other three – and the Grand Slam is if a team beats each of the other five. Wales have now won three Grand Slams since I moved here 🙂 So with this in mind, I made these… Just £12 each, and with the option to have “Grand Slam 2012” or anything you like engraved on the reverse, click the picture to go to our shop. Slate. The backbone of Wales which was laid down some 500 million years ago in the Cambrian period, taking it’s name from Cambria, the Latin name for Wales. Apart from the fine dust, it’s lovely to work with, being relatively easy to hand cut, split, shape, drill and dress. Apart from being very dusty. Did I mention the dust? I was cutting some squares the other day for bracelets, when I had an idea to make dominoes! 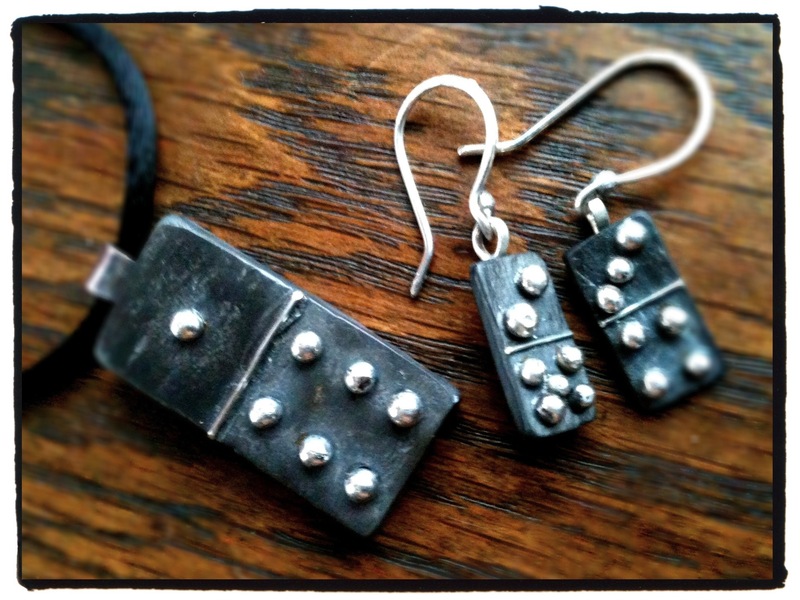 I made some sterling silver balls for the dots, with silver wire dividing each domino in half. 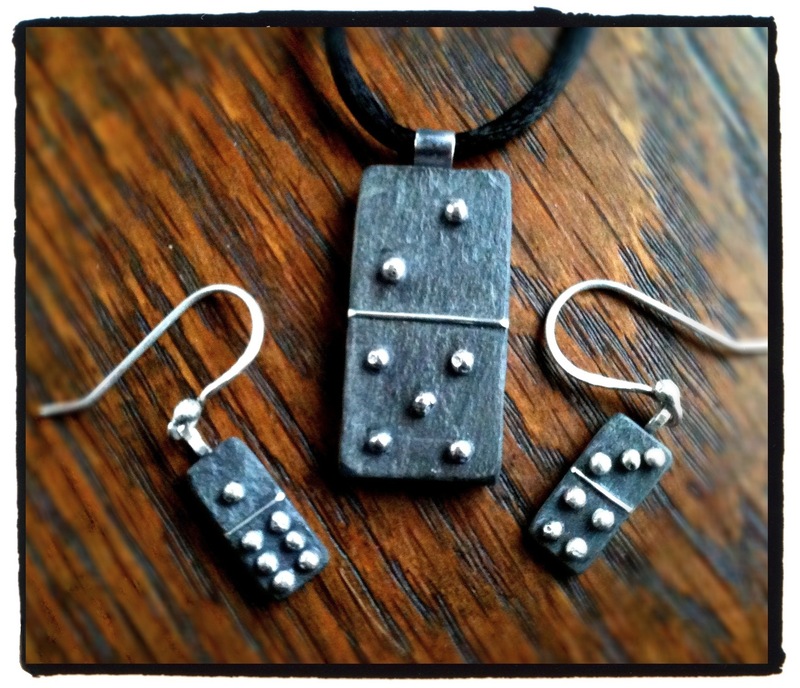 The sterling silver bails on the pendant and the earrings are all hand made by me, as are the earring hooks. 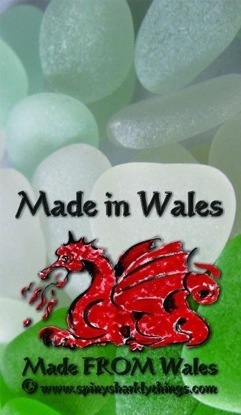 Part of our Made in Wales: Made FROM Wales range, I really like these, I hope you do too! I’ve lived here for seven years now, but grew up only a couple of miles from the north Somerset coast. As a child, we’d go on many outings to Kilve beach, a pebbly affair with cliffs of oily shale and the chance of finding some good fossils. I don’t recall ever actually swimming there, the Bristol channel at this point is best described as brown and lumpy, a spot of light paddling in the rock pools was as good as it got. So I’d find a rock to perch on and stare across the sea, past Flatholm and Steepholm islands, to the mist shrouded land beyond. Sometimes the RAF and Fleet Air Arm would fly up and down the water, practicing bombing runs, this was at the time of the Falklands War. I’d never been to Wales but always felt a strong pull towards it, my first visit was age elevel when we went on a school trip to Big Pit mining museum and St Fagins, the Welsh Folk Museum. I felt right at home, like I belonged. 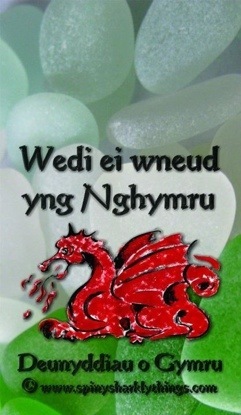 I found out much later in my life that I have a fair bit of Welsh blood in my veins, but could it cause that much of a pull? The Welsh call it hiraeth. I feel rooted here, and a deep love has grown for the Rhondda valley, where I now live with my husband and son. When I’m not in my shed bashing metal and setting fire to stuff, or asleep (having been eaten by the duvet monster), I love to go to the beach. From Llantwit Major, I can look across the water, and I see Kilve, the beach of my childhood. No yearning any more, just fond memories. After a fortifying tea and cake stop in the cafe, we go HUNTING. 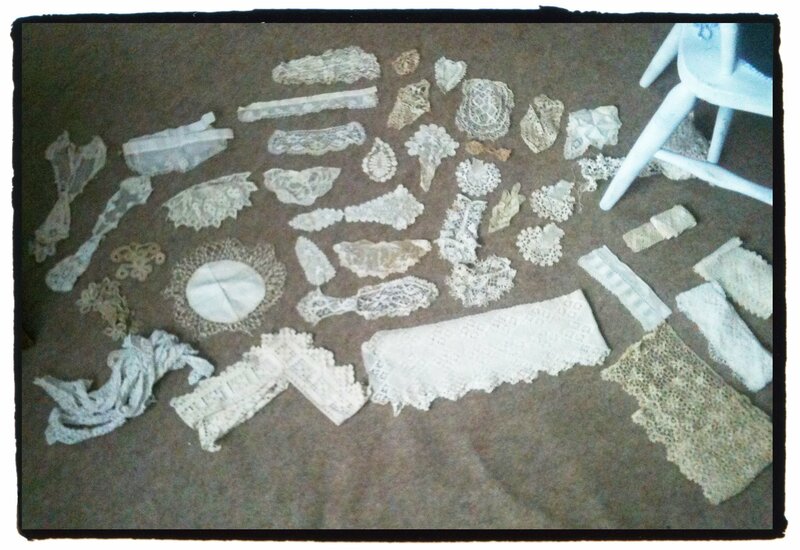 Beardy and Scroticule for fossils, and me for pretty things to use in my jewellery. 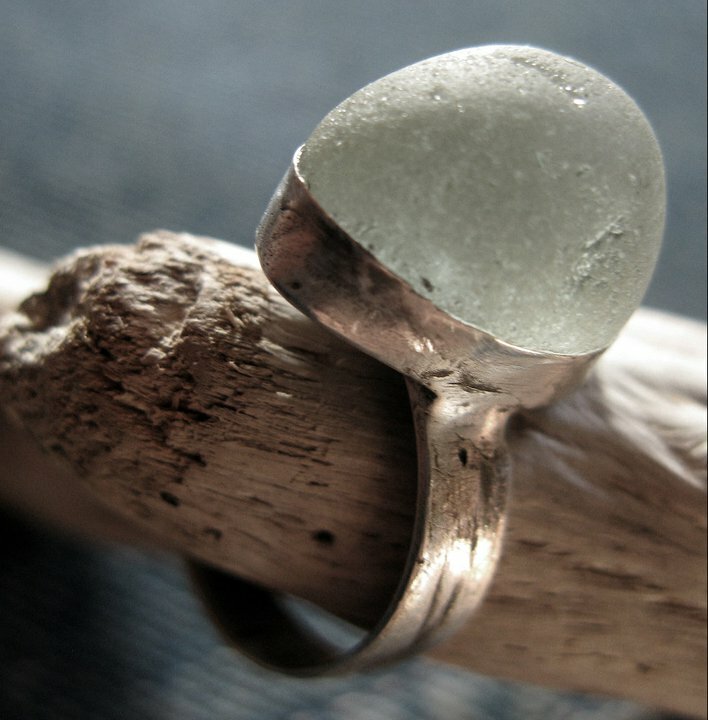 Sea glass is my favourite, sea scoured jewels among the seaweed and boulders. Regular readers will have seen this ring before, it went to a lovely lady in Canada who had Welsh roots and wanted a piece of her motherland. 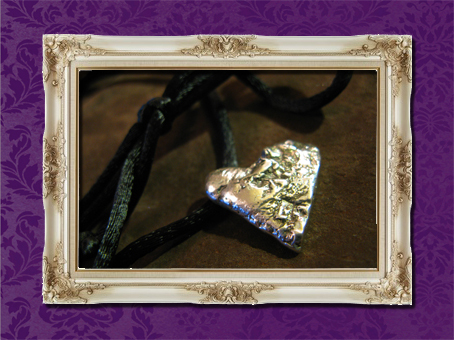 I have also been combining slate, the backbone of Wales, with silver. 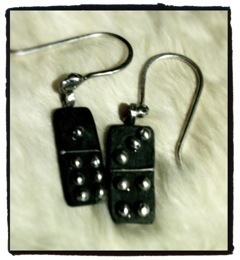 These domino earrings are my newest design, I’m currently making a matching pendant. I have a love/hate relationship with slate. It’s so lovely to work, yet creates just SOOOOOO much dust. But the end result is so worthwhile, the layers and soft edges are so tactile. These are things I have made “from” Wales. Small pieces of the land itself. 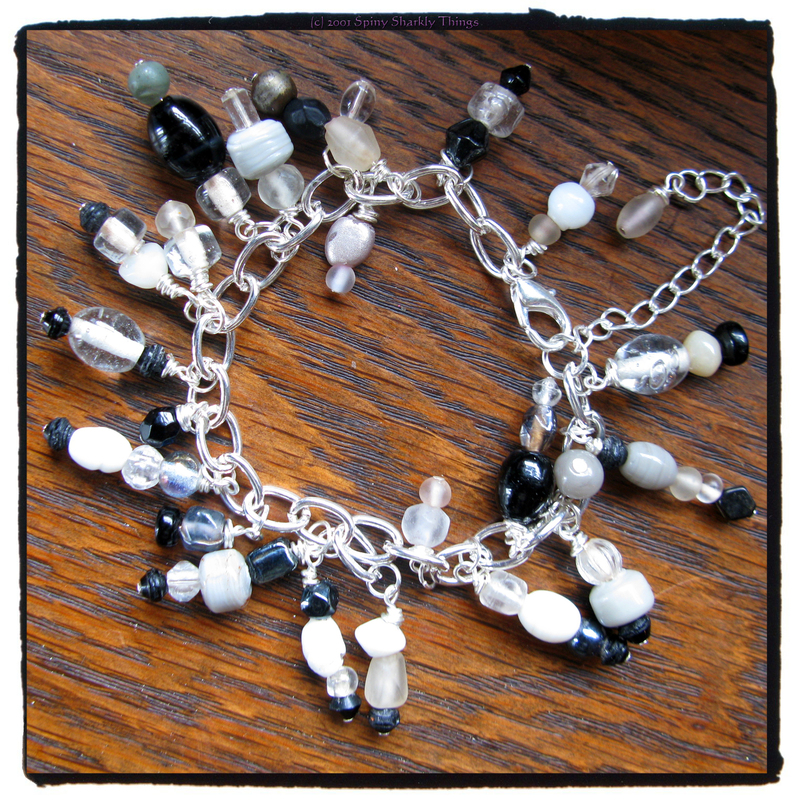 I felt it would be a good thing to give these pieces of jewellery their own identity, really emphasising their origin. 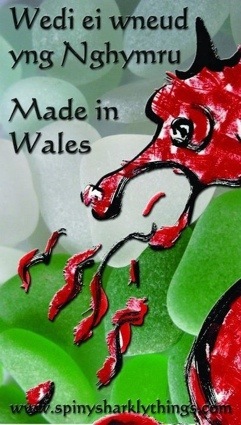 So I’d like to present our “Made in Wales: Made FROM Wales” graphics. 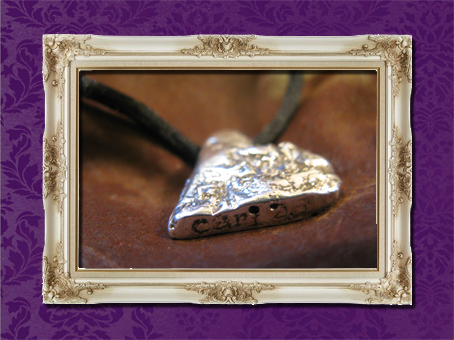 Everything we make that contains a littke piece of Wales will declare itself loud and proud. Hope you like it. All you need is love. La la la la la. With Valentine’s day now being rammed down our throats by every shop in the land, I thought I’d make my contribution. I had enormous fun making this heart! I blasted some silver with the blow torch on a firebrick and when it was all melty, I teased it into a heart shape and quenched it. By repeatedly heating it to just under the melting point and cooling, you achieve this fabulous textured effect called reticulation. I’ve been trying it with copper as well. 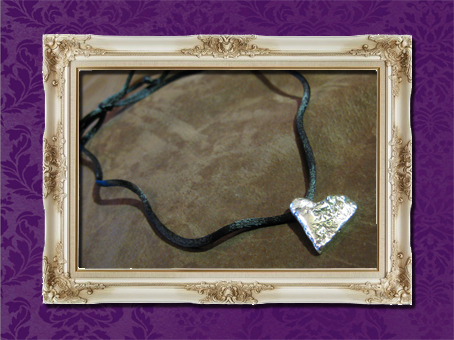 When I had a shape I was happy with, I carved away the sharp edges and soldered a loop onto the back for the silk cord. 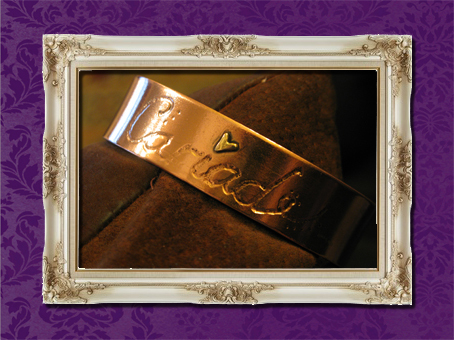 The engraving (below) was done with my lovely new Dremel kit – my Christmas present from Beardy and my mum. 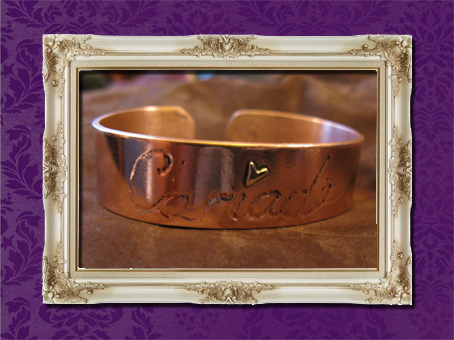 Cariad is the Welsh word for love, so it seemed like a good place to write it. My son wants it for his girlfriend’s Valentine’s present. But as they are eight, I politely suggested that he gets stuffed and made him a pretty little copper ring with a heart on it instead. 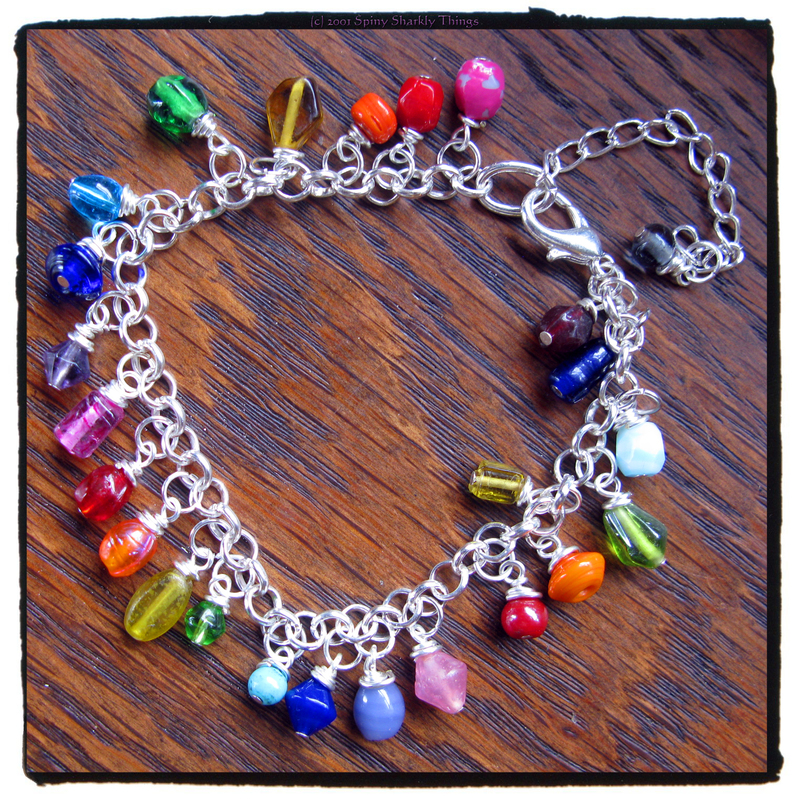 These are for sale in my Etsy shop, the bangle here and the pendant here. 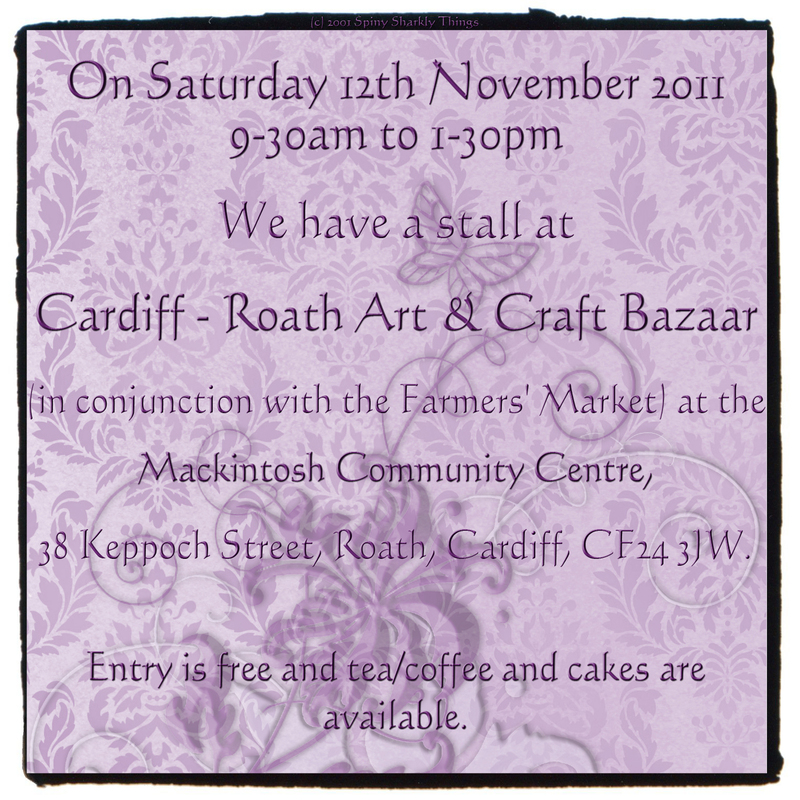 We’ve got our first ever proper stall at a craft market! We are pretty excited about this, it’s one thing selling online, but quite another fronting a shop and selling to people face to face. We’ve done a couple of little table sales at things we are already involved in, so they should be good practice for the real thing. I’ve been reading up on the new Welsh carrier bag charging system, and I think I’ve got it worked out… Little paper bags (sort of greetings card size) are OK, but anything bigger and with handles attract the 5p charge, which we will donate to Help for Heroes. We’re big lovers of nature and finding things when we are out and about here at Spiny Sharkly Things, and a particular favourite haunt is the beach at Llantwit Major, in South Wales. It’s a fabulous stony beach with a very sharply defined set of dinosaur footprints in some petrified mud flats, and there are many other fossils to be found – from ammonites embedded in rocks the size of a VW Beetle to more manageable fragments of dinosaur bone, shellfish and plants. I regularly go down there with my husband and eight year old son to just mooch about – “fossicking” as we call it in these parts. It was on one of these outings that I found this lovely nugget of seaglass – it just glinted at me from amongst the pebbles, so I just had to pick it up. I gathered a fair bit of driftwood that day too, and when I was back home and rechained to the kitchen sink, I decided to create a ring inspired by the finds of the day. This was back in the days when my workshop had to double up as kitchen (or was it the other way around?) 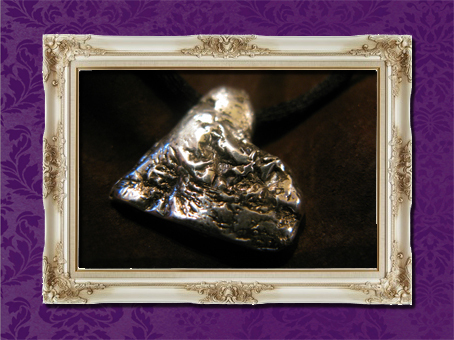 and I was only using precious metal clay instead of the sterling bullion that I work with mostly now (in the shed). I love the way the clay can be easily textured, and until I get a rolling mill, it’s the only way I can get texture into silver that isn’t hammered. 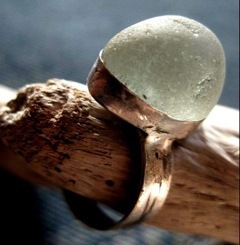 I took a mould of an especially nice piece of driftwood, and made the ring shank from that. It oxidised beautifully in the liver of sulphur and really gives the feeling of the wood on which in is based. In my opinion, a perfect combination, and I was really pleased with the final result. It’s been languishing on eBay for a few months, but that never fazes me, all our creations are individual, unique, and just waiting for the right person to stumble across it and fall in love… I’ve not been silversmithing for all that long, not even a year yet but I really think I’ve discovered my vocation in life. I just love working the metal, it whatever form it takes, and what craft gives you chance to hit things with big hammers as well as twiddle about with fine details and create something beautiful, wearable and above all, SHINY! So everything I make has a lot of myself put into it on the blood, sweat and occasionally tears front (often quite literally! ), and it’s usually quite a wrench to let something go. I’m always happy when they go to a loving home! As my regular readers will already know, I have just registered with the London Assay Office so I can get my jewellery properly hallmarked, and this ring went off to be verified and stamped a couple of weeks ago. Sod’s law struck, of course, and I had an alert come through on my phone that the ring had been sold to a lady in Canada… Cathy had already been in touch to arrange International shipping and so forth, and explained that she had Welsh ancestry, and she had relatives an many parts of Wales, so wanted something Welsh! After explaining that it would take a week or so before I got it back from London, and all was fine, the ring was sent across the Atlantic to Ontario.